Gardeners, nature lovers and families are all springing up at Royal Botanical Gardens (the “RBG”) in Burlington. 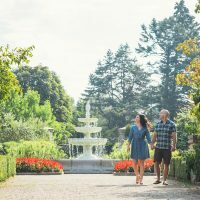 This living, interactive museum is the largest botanical garden in Canada and a National Historic Site with multiple gardens and nature sanctuaries. Here are four ways to spend an afternoon amongst the blooms. RBG offers plenty of guided tours and activities, but it is equally enjoyable to aimlessly wander the various gardens. Hendrie Park is a great starting point for a snap-worthy stroll. Blogger Linda Goodmurphy shared her favourite moments on a recent visit: “It makes me happy just to see the many vibrant flowers in bloom. With so many varieties of colourful flowers and diverse gardens, Hendrie Park is a photographer’s dream. It’s tempting to try and capture each lovely bloom so I have to remind myself to pause and just enjoy the beauty without looking through the lens of the camera. For me, strolling the garden paths is a mood-lifting experience. It’s impossible not to feel a sense of peacefulness in the natural setting of the park.” Hendrie Park is known for its extensive rose gardens, boasting many new and antique roses, and is also home to a fascinating Medicinal Garden. RBG’s sprawling site of over 2,400 acres of land includes The Arboretum, where you’ll find the Nature Interpretive Centre and 27 kilometres of walking trails. These trails are home to more than 50 at-risk species and are a major stopover point for thousands of migratory birds. Throughout the RBG lands, visitors can access various nature sanctuaries where they can climb observation towers, take part in bald eagle viewing, walk the marsh boardwalk, or hit the Escarpment Trail. Outside at the RBG Centre, kids will love climbing and exploring at the Natural Playground, made entirely out of natural materials. Don’t miss the crowd-pleasing Mediterranean garden, Canada’s only Mediterranean greenhouse, where kids will get a kick out of the koi pond, cork trees and giant cactuses. Family-focused special events include Holiday Traditions featuring the RBG train show, and the annual winter exhibit with its Family Day and March Break programs. After smelling the roses at Hendrie Park, make your way to the 6-acre Rock Garden. A magical place, exuding an atmosphere of tranquility and mystery, this garden amphitheatre boasts a state of the art visitor centre, accessible paths, and a charming, irregular network of staircases, linked ponds, bridges, and waterfalls. A short drive will take you to Laking Garden, which offers the visitor an insight into the depth and breadth of perennial plants. If you are in pursuit of a certain bloom, check the RBG’s bloom calendar. Highlights are the iris and peony collections at Laking Garden, one of the most diverse collections of lilac species in the world at the Arboretum, and the extensive narcissus collection in early spring at Hendrie Park. The Royal Botanical Gardens are open year-round – generally daily 10am – 8pm. Check the RBG calendar for special events.